This morning we woke up pseudo-early because we had to do some errands and get to our tour for the Elephant Conservation Center. I had to drop off the scooter and Loni had to get some snacks and water as well as book another night here at TK House. All of this had to happen before 0800 and it did pretty much. Our guide that we met from Pooh Eco-Tourism name was Naret. 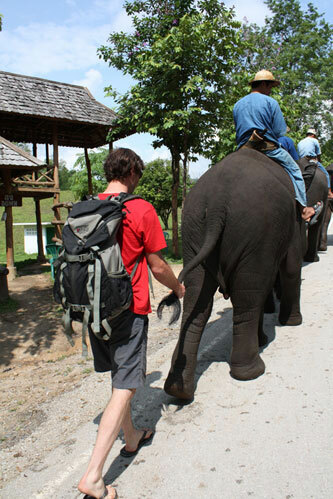 He grew up in Lampang where the Elephant Conservation Center is located outside of. We jumped in his personal Isuzu track and drove the 1.5 hours to Lampang. We were not sure what to expect of the place at all- but it was amazing. Joining in the elephant train. They have about 120 Asian Elephants divided into three groups (riding, show and white). The show elephants are used to display how the elephants were used in the past to move timber and assist with logging. The riding elephants for riding and the rare white elephants are partial albino elephants which only 11 of which exist are for the king. Loni and I went on a short elephant ride through the forest- very cool. 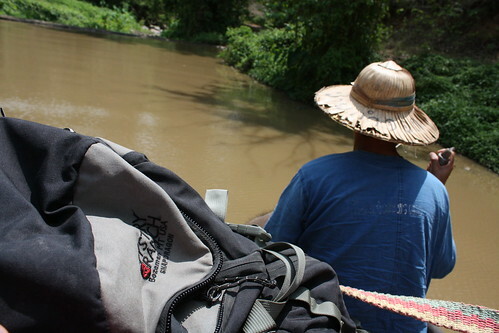 The ride was a lot more topsy turvy than I thought it would be, but still a fantastic way to move through the jungle. 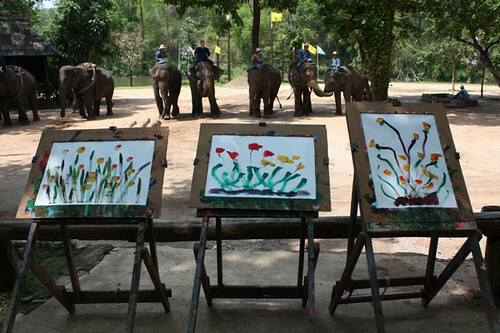 You think your two year old is talented, the elephants painted these flowers right before our very eyes. Elephants obviously produce a lot of waste. One of the most interesting things about the E.C.C. is how they use the elephant dung. They actually use it to produce a biofuel (methane) to generate electricity and for cooking for the entire facility. In addition to the biofuel they make paper from the fibers left over from the fibers they also make fertilizer. That in of itself is amazing- even more amazing was the fact that the place is self sustained all of the bananas, sugar cane, bamboo and other foods are grown and the E.C.C.. We also saw the hospital with all the facilities to work on elephants- and they have a mobile unit that does all of the mobile unit for free! After the E.C.C. Naret took us to the “jungle market” outside of Lampang- this place had food that is certainly based on a dare. Evidently the people of Chang Mai do not even attempt to eat. Here are a couple of the tasty treats that our eyes feasted on., Red Ant Egg Salad- though the eggs are still raw and ants were hatching from them- you need to cook them. Lots of frogs of all different types some alive in buckets some dead and some on sticks. 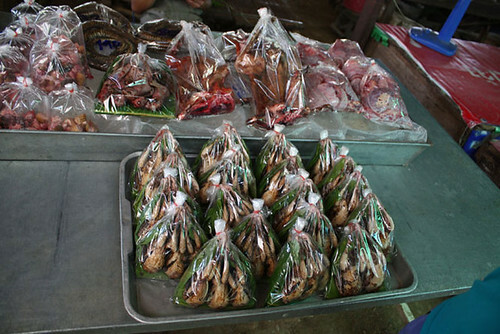 Skinned snakes, skinned jungle cats, eels, live fish hanging in bags like you are buying them for an aquarium. All sorts of fruits we bought some fried banana and Thai Mangoes- which are small mangoes that you can eat without pealing the skin. 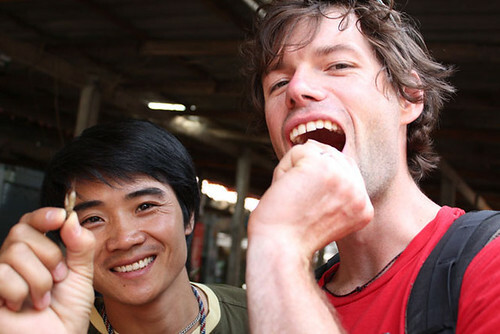 Naret suggested that I try some insects- after the grasshopper I tried in Chang Mai I felt ready for something else. Naret and I enjoying some crickets.